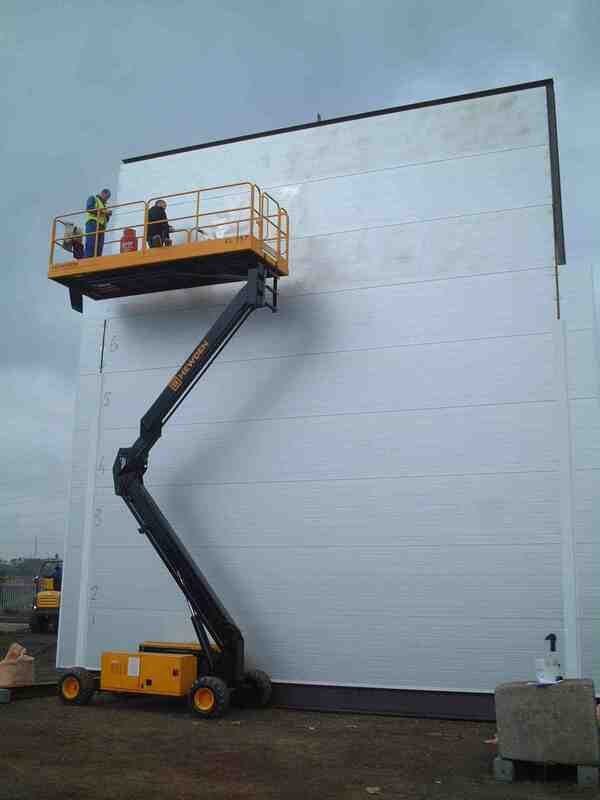 Assessment of fire resistance of large sandwich panel fire walls. I was commissioned to determine what work should be done by a major UK panel fabricator (Eurobond Laminates) of non-combustible internal fire walls in order for me to make an authoritative assessment of fire resistance of wall panels spanning horizontally approximately three times the largest span that can be tested in a standard UK furnace i.e. roughly 9m. I had made major contributions to published work on the behaviour of sandwich panels in fire over the years. 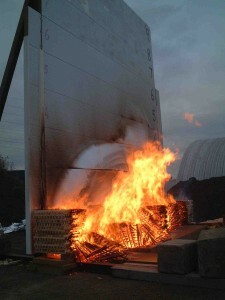 Since the fire integrity of the panel relies on the integrity of the unexposed steel face and this will bow as fire progresses, I considered it important to undertake a full scale ad hoc fire test to supplement fire resistance tests and this was successfully accomplished using a 9m by 10m high assembly of panels exposed to a very severe fire consuming a fire load at least five times greater than the fire load employed in the large Factory Mutual corner wall test. Many Technical Notes and reports were produced on the system, then called Performa, and this work (advice on concepts, design and testing, and preparation of technical literature) enabled the behaviour of variants of the panel system in a fire to be confidently established. I made a survey of the building and advice on the design of new 2 hour fire wall including flexible fire stopping and means to accommodate unsympathetic thermal bowing in steel columns. I was asked to give expert advice on a proposed fire wall 24m high by 80m wide in a 200m long document storage warehouse. The fire wall was of unusual design as it comprised two independent cantilever walls each possessing 4hr fire resistance through the use of 4hr rated structural sandwich panels with steel faces and non-combustible rockwool cores fixed to large rolled steel I-section cantilever columns. I gave advice in several areas: scrutinising and commenting on the test laboratory’s fire resistance test report; researching the FM and NFPA221 guidance on fire walls; making calculations of incident thermal radiation intensity arising from flames above the top of the fire wall and commenting on the effect this would have on the adjoining roof; quantifying the magnitude of thermal bow in the 24m high cantilever columns; commenting on details of supporting fire resisting roller shutters from the sandwich panels; and preparing a fire safety strategy for the design of the fire wall.